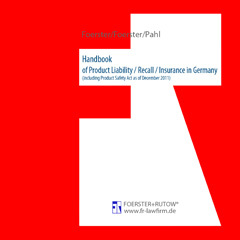 This chapter provides the reader with an overview of product liability under German law. It covers claims for damages caused by a defective product under different statutory sources, including the different preconditions and consequences of such claims. This chapter informs the reader of the obligations of producers and distributors under German law covering product recall. Furthermore, it provides information regarding the relevant authorities covering product recalls for the main sectors of industry and commerce. This chapter explains the different and specific insurances that cover product liability in Germany, such as: Business Liability Insurance, Product Liability Insurance, Product Recall Insurance, Contaminated Products/Financial Loss Insurance and Product Guarantee Insurance. The fr_dkm_productliability database is a digital knowledge management tool available to companies or businesses to help them fulfill their legal obligations in regards to product liability.